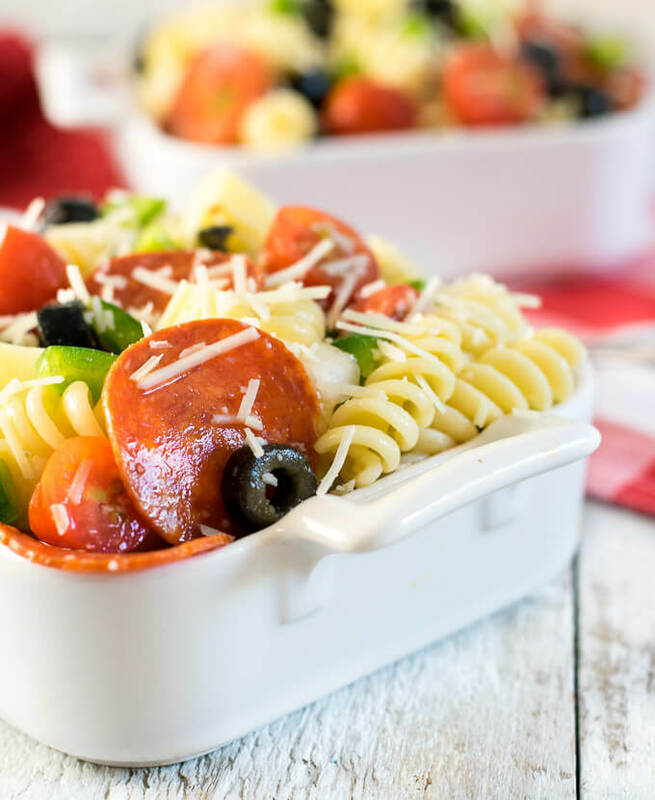 This Pepperoni Pizza Pasta Salad is loaded with the satisfying flavor of your favorite pepperoni pizza and is perfect for your next picnic or potluck! I am a sucker for a good pasta salad. Tender chilled noodles, coated in a flavorful sauce, all tossed with chunks of cheese and vibrant vegetables, what’s not to love? I whip up this recipe when I need an effortless dish to pass at a pot luck, but I also enjoy it as a lunchtime side dish. A local grocery store near me often served Pepperoni Pizza Pasta Salad in its deli, and I’ve always loved the big pizza flavor in each bite. Italian dressing really ties together the meaty pepperoni, and tender bites of mozzarella cheese. Recreating their recipe was not very difficult. It is simply a matter of adding classic pizza toppings to a bowl of cold noodles, pouring in some Italian dressing and VIOLA! You have a masterpiece! I like using rotini pasta for this Pepperoni Pizza Pasta Salad. Believe it or not, the type of pasta you use makes a difference. The ridges in rotini pasta are nice because it gives the Italian dressing something to cling to, allowing for better flavor distribution. However, making pepperoni pasta salad with tortellini would be exceptionally delicious as well! Make sure you have a kitchen colander (affiliate link) for this recipe. No one wants a warm pasta salad. After boiling the noodles you will want to rinse them in a colander till they are cool. I like using a colander with a flat bottom so I can simply set it in the sink without holding onto it. 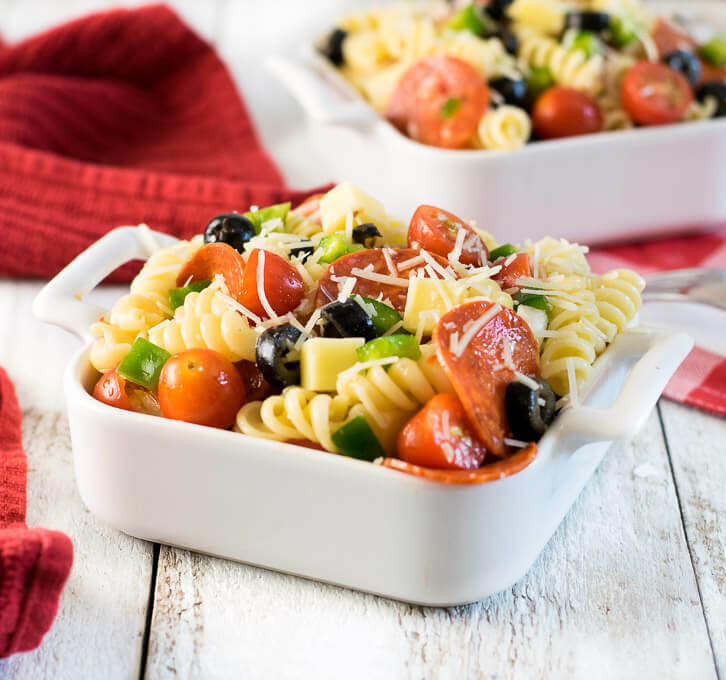 Although I make this recipe as a pepperoni pasta salad, there is no reason you cannot customize it to match your favorite pizza toppings. For example, if you would rather have a sausage pizza pasta salad, just break apart Italian sausage into little rounds, cook in a skillet until browned, and add to the pasta salad. This pepperoni pasta salad is not the only delicious pasta salad in my arsenal. Over the years I have developed quite a few that I absolutely love! 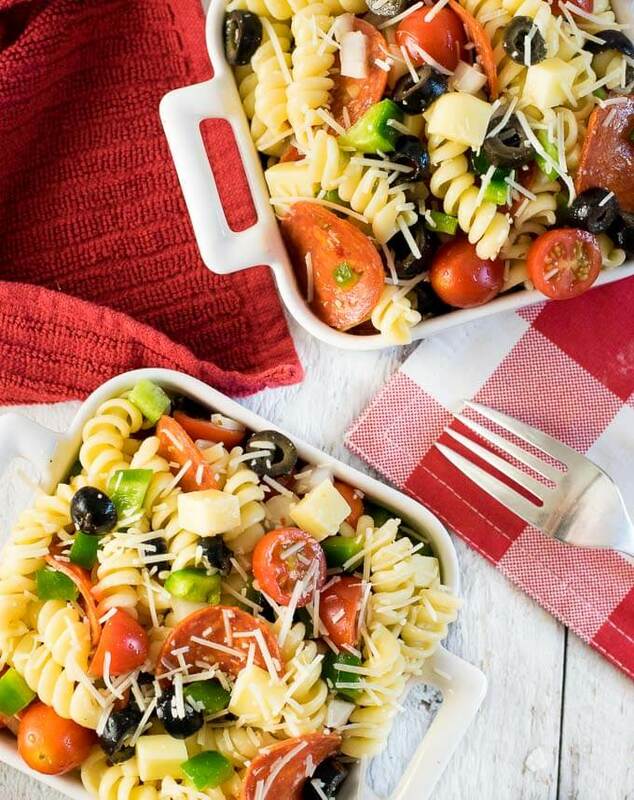 These include classics such as seafood pasta salad, and macaroni salad, as well as creative concoctions like BBQ pasta salad, my creamy taco pasta salad, or even a fresh tasting feta and dill pasta salad. I hope you’ll check them out! In pot of salted water, boil noodles according to package instructions. Drain pasta from water, rinse in a colander under cold water till cool, then add to large bowl. Add all ingredients to the large bowl and mix to combine. IF YOU LIKED THIS RECIPE you will love my Dill Pickle Pasta Salad! This pasta salad was originally published on FoxValleyFoodie.com July 25, 2017. If you enjoyed my Pepperoni Pizza Pasta Salad recipe then you should probably like me on Facebook and follow me on Pinterest too. That’s what I would do at least, because if you don’t get to know me but you still use my recipe it is kind of like taking candy from a stranger, and your mom taught you not to do that. Don’t disobey your mom, subscribe to Fox Valley Foodie today. Mmm…I love pasta salads, too! I recently did a huge post with 9 different varieties, but pepperoni pizza was not one of them! I’ve got to add this one to my repertoire! Have a great time on your trip!